Dr. Mohamed obtained his Master Degree of Paediatrics from Cairo University, Egypt in 2008, MRCPCH part 1 and 2 from RCPCH (UK). Dr. Mohamed has a vast experience of 17 years in paediatrics, Neonatology and PICU. He worked as Paediatrician and Neonatologist in Nasser institute Hospital and Kids Hospital in Cairo till 2009. 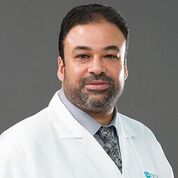 Prior to joining NMC ROYAL Hospital, Dr. Mohamed was working in Al-Jahraa Hospital in Ministry of Health, Kuwait, as Paediatrician in PICU, NICU and General Pediatrics. His special areas of expertise are PICU in all types of ventilators including high frequency oscillation, Cardiopulmonary resuscitation, managed cases of Status epileptics, Status asthmatics, Shock, DKA, Respiratory failure and various other emergencies. He also carried out Endotracheal intubations, airway management, Insertion of central line, Lumber puncture and Intra-osseous line insertion. Dr. Mohamed has participated in BLS, PALS, ECG & Pharmacology and Airway Management from American Heart Association, also EPLS provider course certified by European Resuscitation Council. Dr. Mohamed is well versed in English and Arabic.